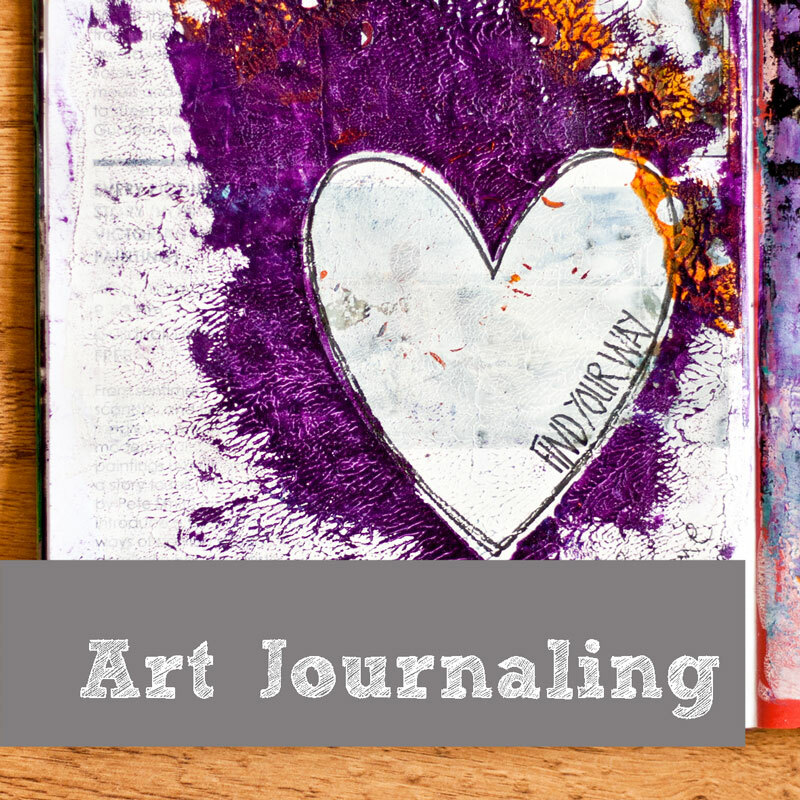 Hello folks, I’ve got my challenge card for Cute Card Thursday and Pixie Dust Studio for this week and we have two great challenges to get your creative juices tingling! 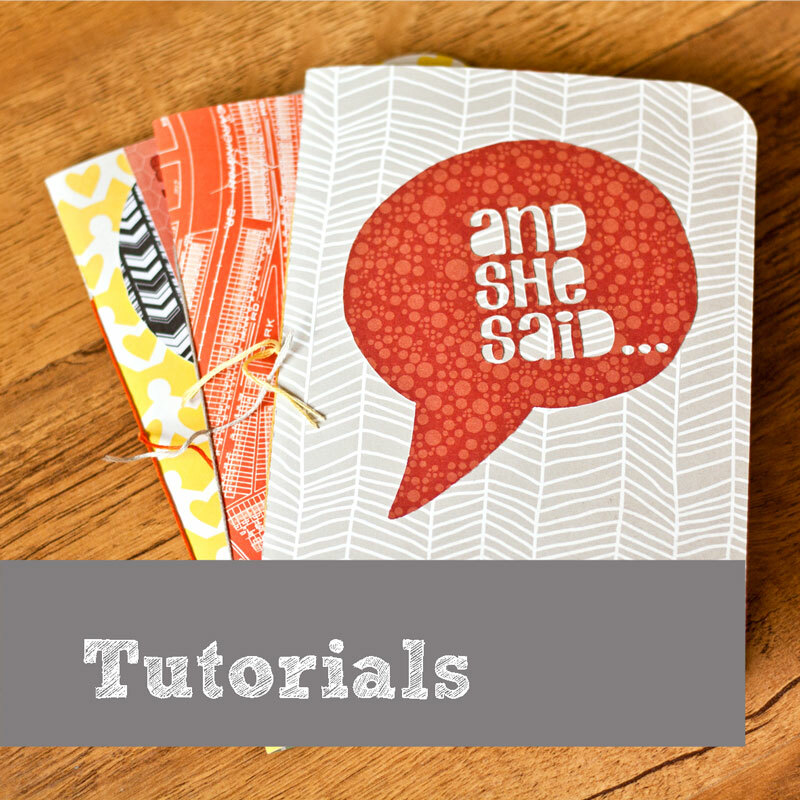 Cute Card Thursday is all about using punches and Pixie Dust Studio is about going back to school. 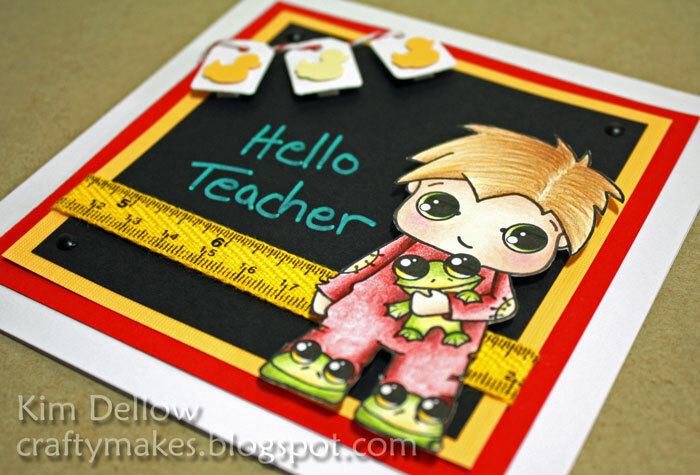 So here is a little ‘Hello Teacher’ card to start the term for Kindergarten/ Primary School with Pixie Dust Studio’s Walter’s Jammies using the small Kurepunch Duck and medium Kurepunch tag M.
The ‘Hello Teacher’ uses a ZIG Chalk Writer from Kuretake to write on the ‘blackboard’. Hope you have fun with these challenges this week. Wow is it Thursday already? 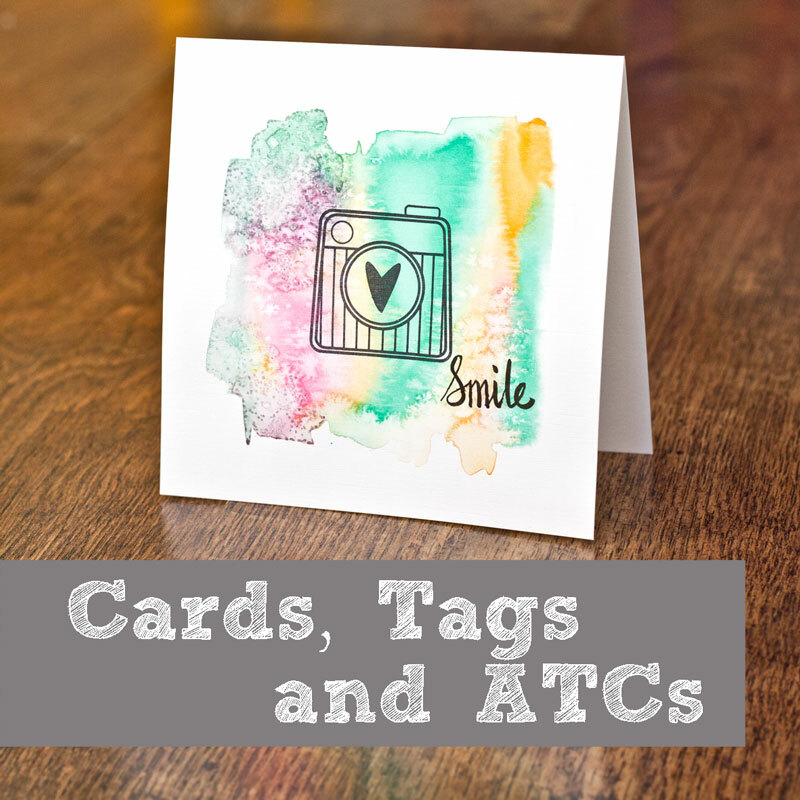 It is, so that means it is the Cute Card Thursday Challenge day and the Pixie Dust Studio Challenge day and my card fits both! Hurrah! 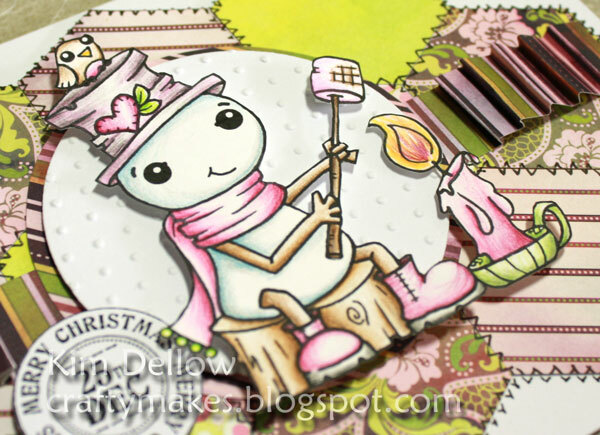 The Cute Card Thursday Challenge is a sketch and the Pixie Dust Studio Challenge is to include a tag. 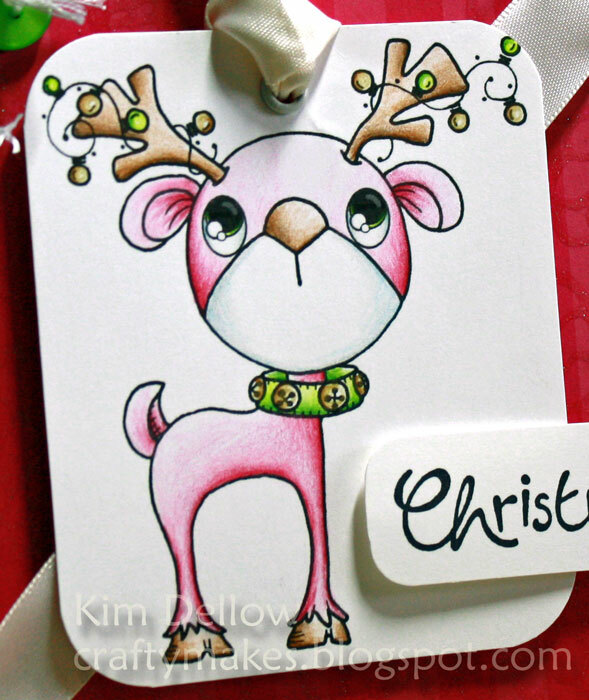 I’ve used the cute Socket the Reindeer from the Pixie Dust Studio Winter Release. Hope you enjoy the challenges! 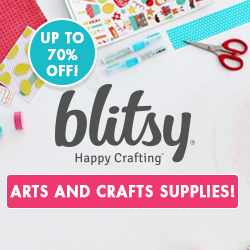 If you are near your TV or computer today check out the Creative Expressions shows on Create and Craft today at 12pm and 4pm. Some of the cards I was busy with last week using Frilly Things, If the Shoe Fits & You Look ‘Scent’sational stamp sets will be on the show with Jo Channon. 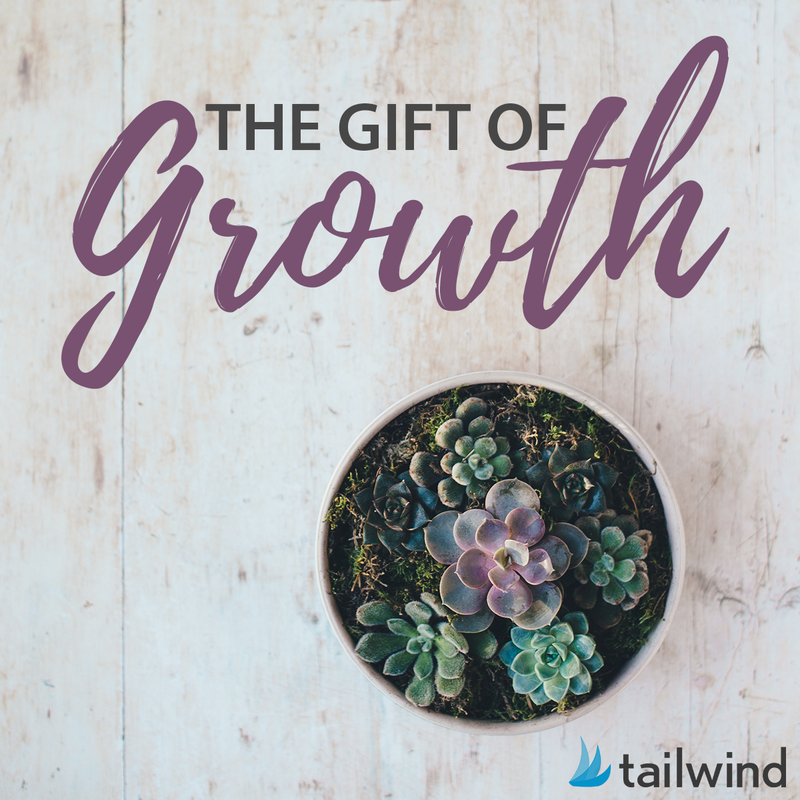 Pixie Dust Studio – Release Day! 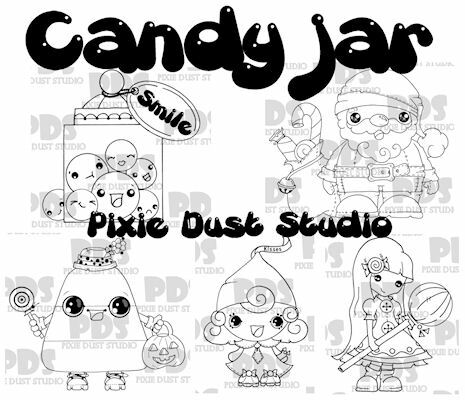 If you pop over to the Pixie Dust Studio blog you can see them in action! Bear with me on this one! 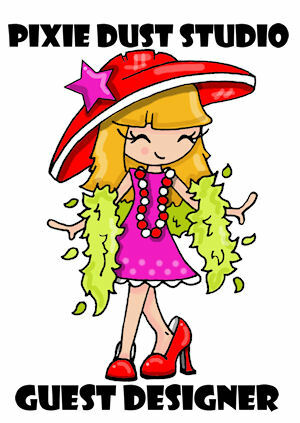 What I thought was I would go for a tweeny teen that is into her patchwork and craft – what do you think? I’ve used Smore Candle Treats from the Pixie Dust Studio Winter release. But then so would I with toasted marshmallows! Yum! Don’t forget to check out the weddings themed challenge over at Cute Card Thursday this week as well. 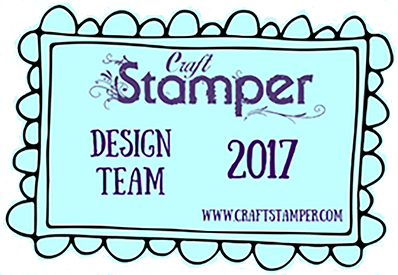 It’s Thursday and I have my DT card for both the Cute Card Thursday Challenge and the Pixie Dust Studio Challenge this week. 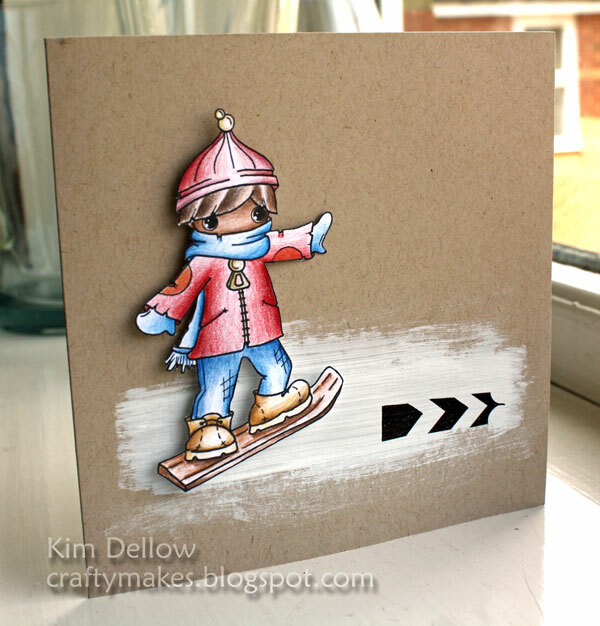 I’ve used the new Pixie Dust Studio Ski Dude from the new Winter release. 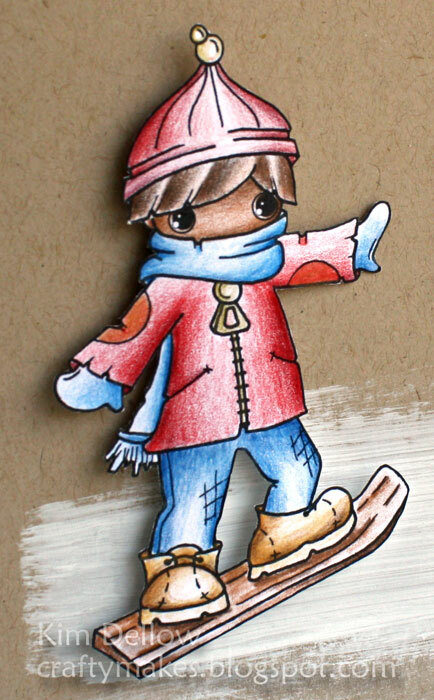 He looks very cool snowboarding! Well hope you have fun with these two challenges. I know that a lot of you well organized people are already doing your Christmas cards, not me I like to leave it to the very last minute and then give up and buy my Christmas cards, or just not send any at all! 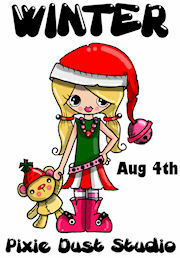 But for you guys that are totally on top of these things today is your lucky day! 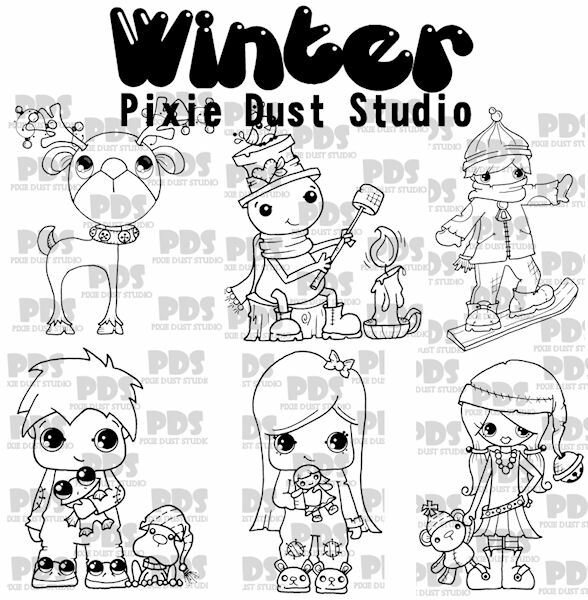 It’s the Pixie Dust Studio’s Winter release and there are lots of super cute Christmas themed images to pick from. So I thought I would make a Chrimbo card to show you and I’ve merged it with both the Cute Card Thursday challenge which is ‘No Designer Papers’ (check the blog for the sponsor this week) and the Pixie Dust Studio challenge which is ‘Anything Goes’. No excuse to leave those Christmas ’til the last minute again this year! Enjoy yourself on the two challenges! 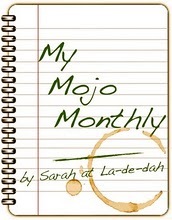 I’m just dropping by to let you know that Sarah’s My Mojo Monthly post has gone live and if you are interested it is little old me answering the Five Mojo Questions this month! Eek! So do pop along to have a good old laugh at my answers LOL! Not that I’m suddenly feeling a bit self conscious or anything *embarrassed grin*. 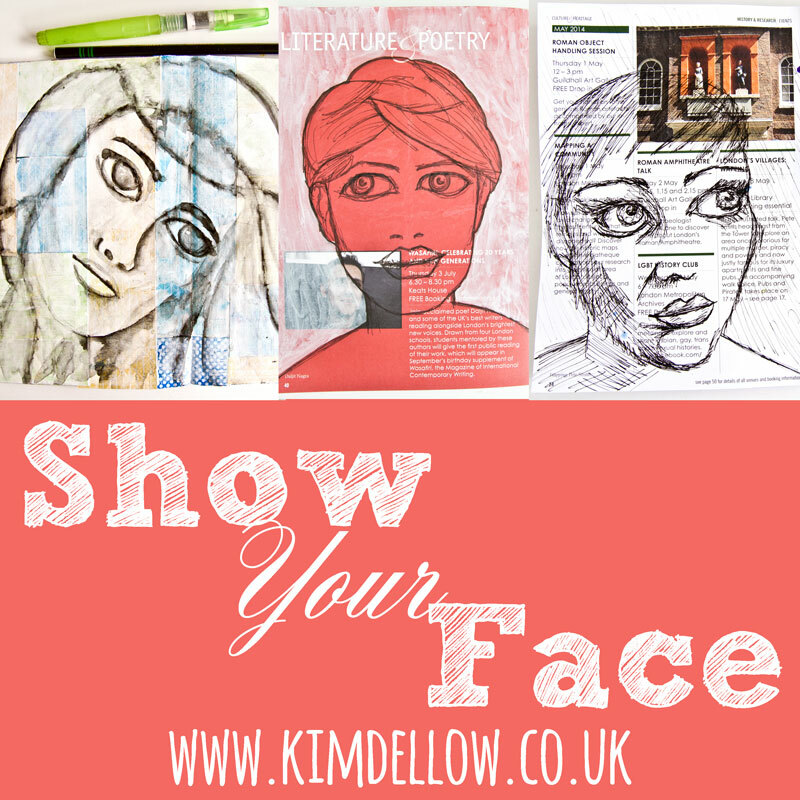 Also she has some gorgeous ideas to share and inspire and don’t forget you can join in too and share your inspiration and be in with a chance to win goodies! 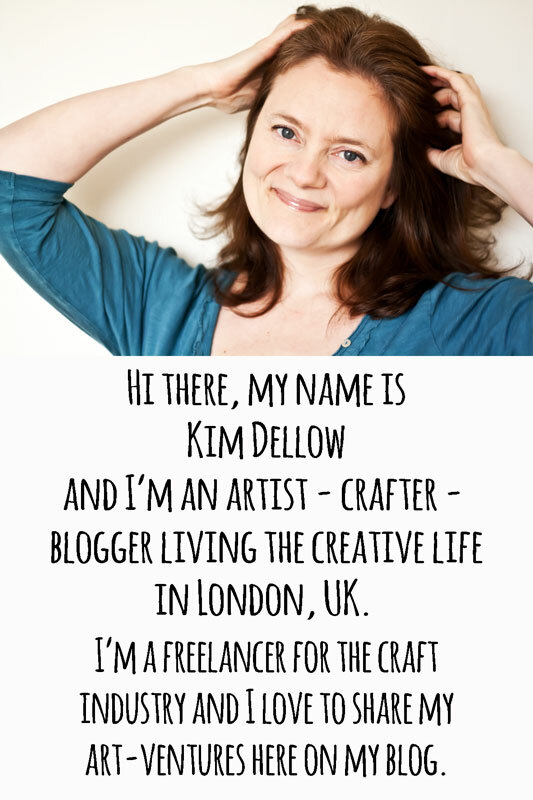 This month is proving to be another busy one for me as I have the HUGE honour of Guest DT-ing for Pixie Dust Studio and I can’t wait to share the upcoming release with you – when I’m allowed to of course (4th Aug keep your eyes peeled!). 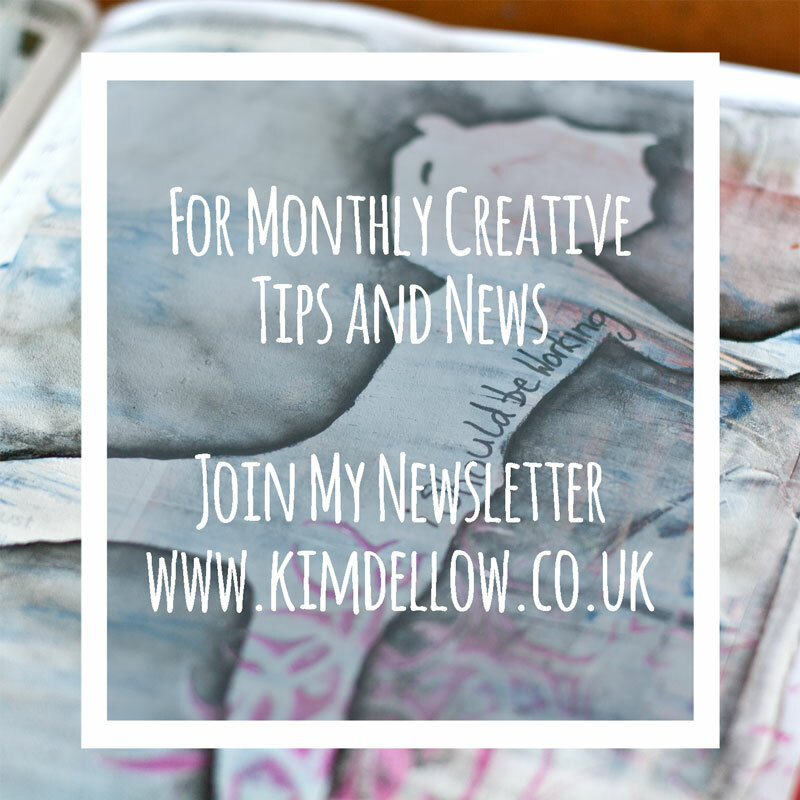 Check out the Pixie Dust Studio Blog to keep up-to-date with the news and you will find me joining in with challenges over at the Pixie Dust Studio Challenge blog on Thursdays. Looking forward to seeing you there! 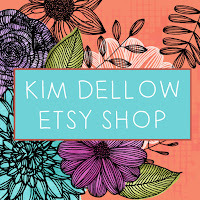 I’m also tickled pink to be a Guest Designer again for Alter It Monthly and I’ll be posting about my Alter It Monthly DT piece later this week. But if you want to have a sneaky peek at it before you see it here then pop on over to the Alter It Monthly Blog. I think you might be in for a little surprise! 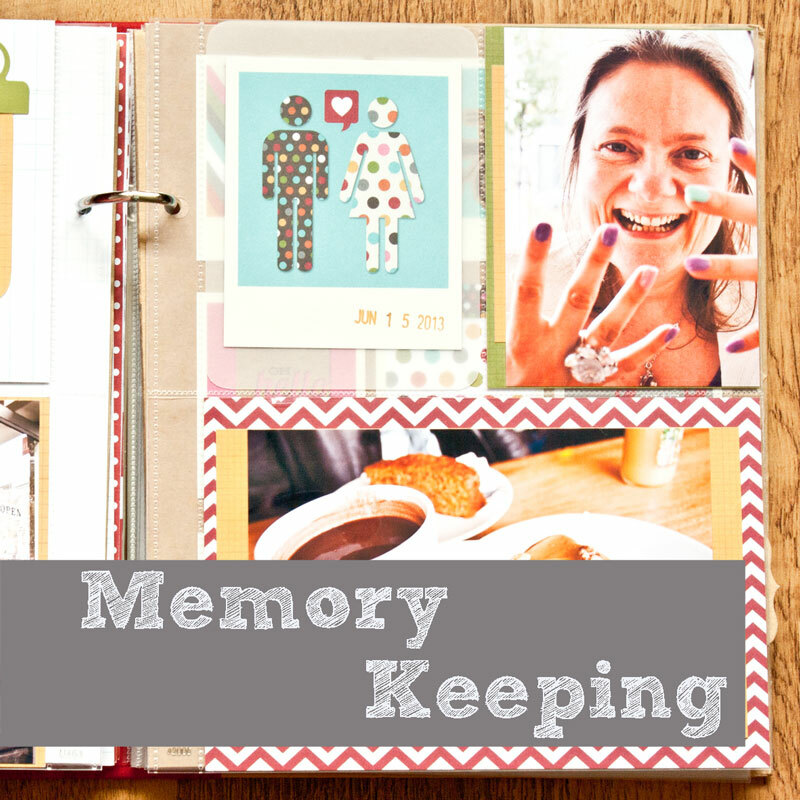 Oh boy – I can’t hang around here gabbing to you lot, I need to get some work done!